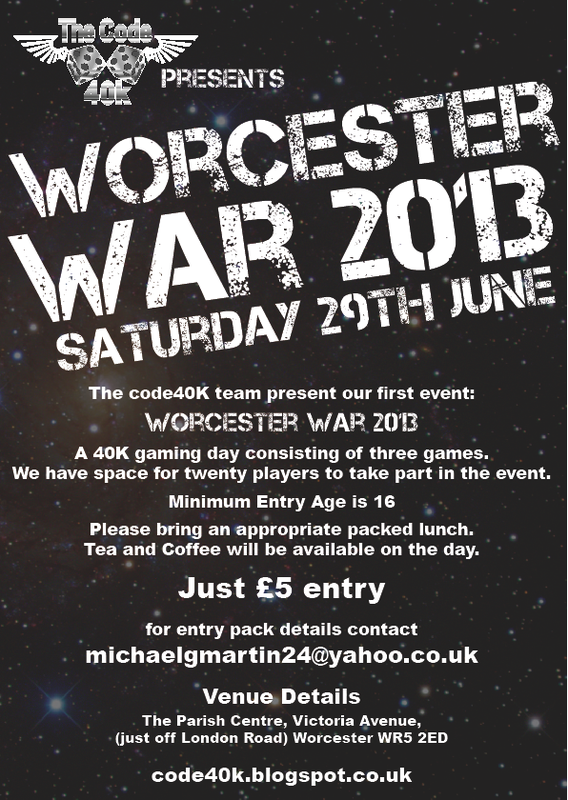 So today marks the 1 month to go time frame to Worcester War 2013 and work continues apace for everything to be ready in time! 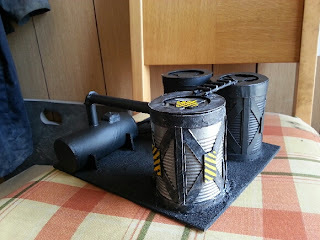 Todays post will be picture heavy showing off some of the terrain that has been finished and some of the work completed by a friend for WW13. At time of writing we still have 4 places left for WW13 on the 29th June. If your interested please click here. 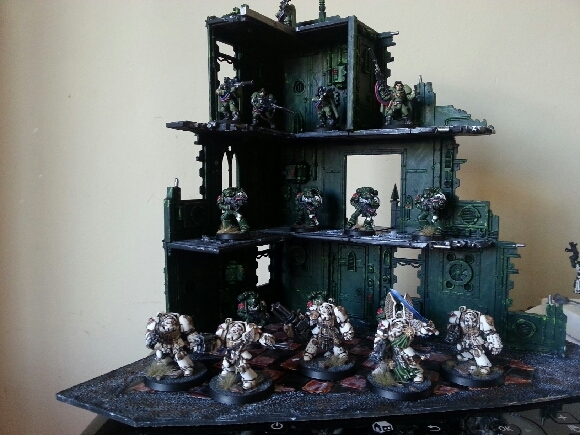 I would also like to show a friend of mines new Dark Angels work and his new terrain work. 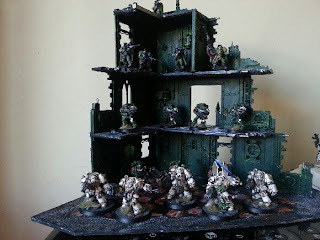 PMR is returning to the hobby after 10 years away and we have all been impressed on the quality of his work when he hasn't painted for 10 years! 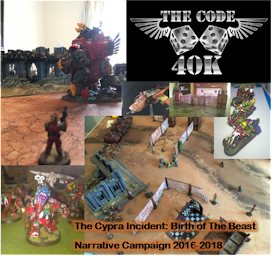 Also the fact that since January he's learnt the rules, painting up an army for the event, building a game board for the event and building and painting scenery for the event! That's getting on with it!! Enough of my ramble more pics! “All is quiet, it would appear” came the reply. Unknowingly they had passed through a dampening field and a group of rebels of The Church lying in wait, shielded from their auspex scans. Captain Kearosen Diritz stood with his head tilted slightly to one side and touching the ceiling inside the Rhino’s passenger compartment. Two more battle brothers from the 4th Company of the Emperor’s Eagles Chapter stood with him. Another eight people sat along the sides of the compartment. Five men sat to one side. Four of them wore heavy green tunics or robes. Their faces were masked with black leather straps. To look at them you would be mistaken to thinking they were a misfit bunch having crawled out from under a hive city. They were in fact veterans of the PDF, the Governors own “Barator” Elite Guard. Sat in the middle of them was a pale robed man under their protection. He was Grandis Brinn, Liaison to Governor Shonai West. From the look on his face he was not enjoying the ride. Beads of sweat covered his brow. Opposite was the Imperial Administrator, Prefect Patrinor with his two aids sat either side, Sympath I and Dedidex. Sympath I was a plain looking woman with tired eyes and long auburn hair. Her augmetics were concealed where in contrast Dedidex was almost more machine than man. He was in no position to care as his mind was controlled by Prefect Patrinor. The Prefect was a large man in every way including his presence. This was not due to muscle bulk, rather to good food and drink of the finest quality. As the Rhino increased to cruising speed Prefect Patrinor looked up at Kearosen Diritz, his steady gaze meeting the Captain’s, “What’s our status Captain? “The streets are quiet Prefect. My men have scanned the route. This approach through the industrial district is the best and most direct at this time of morning. Enforcer Irongate, leader of the rebels, stood with his back against the metal skin of the machinery housing on the far side away from the road. He turned and spoke to Hooper Heat next to him, the words sounding metallic through the grill of his death mask. “You know what to do with that Meltagun boy”. Hooper didn’t say anything, but just nodded uneasily when he looked into the cold hard eyes behind the death mask. Krackin had his sights trained on the Rhino as it came towards them up the street. It first passed under the gantry ahead and then the detonations sounded. Huge chunks of masonry rained down ahead of the Rhino and behind it effectively blocking it in with the warehouse building and sewerage machinery either side. Krackin squeezed the trigger and the missile streaked down from the gantry to impact just in front of the APC. The explosion shook the vehicle and caused it to skid to a halt, the metal tracks ripping up the surface of the road. Krakin’s expletive was drowned by the subsequent weapons fire from the hidden rebels. Hooper swung around from the sewerage plant and fired the meltagun from the hip. Intense heat built up in his weapon as the humming energy increased in pitch. In an instant the beam of energy lanced toward the Rhino searing the front armour, but left Hooper slack jawed when he realized the vehicle had withstood the shot. Irongate dashed past Hooper in a charge towards the stationery APC. The first salvo of missiles and heavy stubber fire ceased. The release bolts to the left and rear doors fired and the doors fell with a crash as they swung on their lower hinges to the ground. Diritz was out first, filling the space between the Rhino and warehouse, bolt pistol leveled in front of him. The other two marines, Berenito and Kol Lars exited quickly and immediately fired into the barricades to the front and rear. The Barator Elite Guard came out from the rear of the Rhino and were met with returning small arms fire from solid shot stub guns. Travis, the lead Barator, yelled and fell as heavy stubber fire poured down from Stub Toes on the gantry to his left. He felt little of the injury to his shoulder in his adrenalin fuelled state and started to pick himself up. Nikaulus and Flex emptied their shotguns at the Undesirables behind the barricades, and Gavier sent a frag grenade from his launcher into their midst. The Undesirables’ nerve broke and they fled from the barricade down the street. Captain Diritz led Prefect Patrinor and his aids through a nearby door on his right into the adjacent warehouse. Brothers Berenito and Kol Lars quickly following inside as slug shot pattered off their armour. Suddenly from out of the shadows inside the warehouse came shots of stub round at them. They flew past Captain Diritz and one embedded itself into the metal workings of Dedidex’s chest forcing him back a step. Brother Berenito returned fire from behind the others and caught a Rabellion in the neck. The explosive core bolt round removed the man’s head in a fountain of blood. The other Rabellion next to him had already moved and was charging towards Diritz. 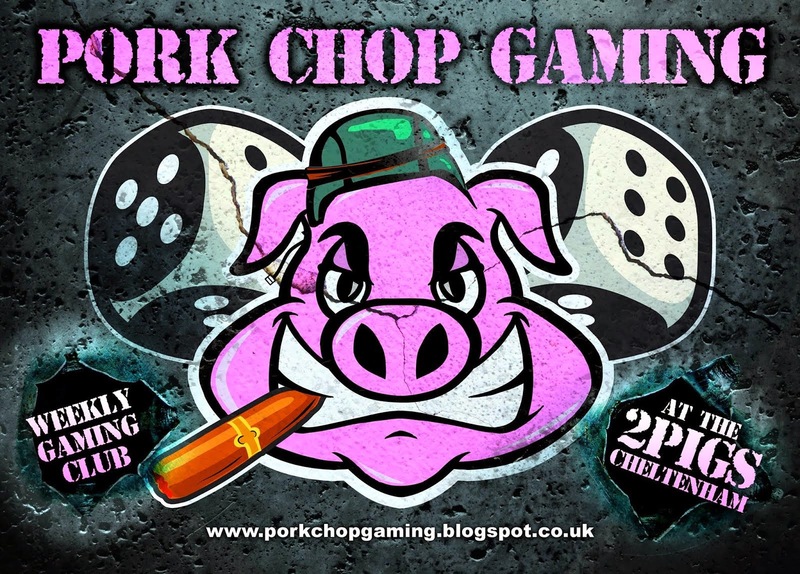 The man snarled, chewing a cigar in the corner of his mouth as he pulled out a long bladed dagger from over his shoulder. The glint of steel flashed up at the Captain’s face, but he casually flicked it away with his left forearm. Then grabbing Gravesend’s dagger arm he brought his own humming power axe in a swift arc into the top of the man’s skull splitting him clean in two. Irongate ran across the open ground to the front of the Rhino. He activated the Powerfist sheathing his right arm and punched with all his might through the armour of the APC. The crackling power field around the ancient fist surged and distorted the metal around it. Deeper he thrust into the mechanics of the vehicle until he struck the engine. The powerfield ignited the fuel and Irongate felt himself thrown back through the air. Consciousness left him the instant he hit the ground. From the rear of the Rhino the blast caught the Barator Elite squad in the back and knocked them over like matchsticks in a gale. 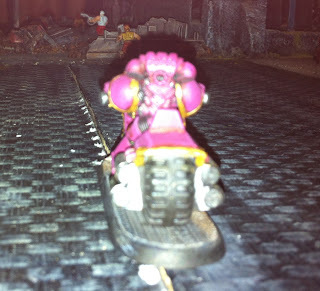 Grandis Brinn took the brunt of the force as he stood on the ramp at the rear hatch to the Rhino. His charred body landed in front of the group. What little was left of his robes were still on fire. Back inside the warehouse Sympath I shrieked and dodged to one side. She had been looking out of an open window when a blur of fur on four powerful legs leapt in and pounced onto the back of Dedidex. Huge jaws clamped around his neck as he was sent sprawling onto the floor. The large hound released its grip on the poor aid and rolled quickly to right itself and turned. With wild amber eyes and the sharp scraping sounds of its claws across the ferrocrete floor it hurled itself at Sythpath I. Kol Lars quickly intervened by thrusting his arm in front of the woman into the jaws of the slavering beast. The force of the impact from the leaping hound spun the Marine around and they landed in a heap on the floor. While the hound kept its jaws firmly locked on his arm Kol Lars pulled his chainsword from the magnetized clip at his belt and activated the motor. 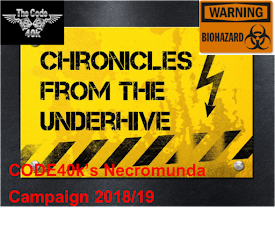 With a harsh buzz the teeth of the chainsword whirled and then with a stroke bit into the back of the beast spraying blood across the floor and himself. Krakin and Fragin felt the heat from the blazing Rhino from below but continued to lay down suppressing fire on the PDF further away. Shadow and Brothox who were on the gantry with them moved away and down the stairs into the warehouse. As they made their way down to the ground floor they saw a group of figures exit the warehouse on the far side. Captain Diritz exited the warehouse with the two Marines bringing up the rear. They had left Dedidex lying in a pool of his own blood. Berenito had indicated that the aid had landed badly onto his face, the metal implants causing internal bleeding. Prefect Patrinor had simply waved the group on to continue knowing time was crucial. A group of men with two large hounds rounded the corner of the building ahead. Kol Lars dropped to one knee and aimed down his sight. 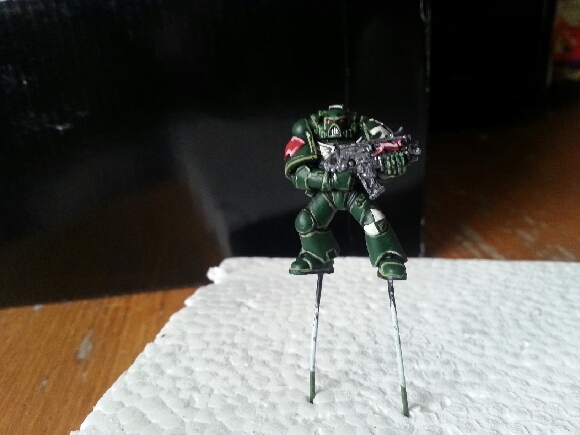 His bolter fire joined with Berenito’s and exchanged with stinging stub rounds from the group in front of them. Two of the men ahead went down and Captain Diritz shot the first hound between the eyes as the two animals bounded forwards. The beast had already pounced at Diritz and its dead weight from the forward momentum still caught him square in the chest. He turned with the force and flung the hound to the side. The second hound was too quick for the Captain to deal with in time. It streaked past and crashed into Sympath I before she could cry out. It knocked her to the floor and savagely sank it’s fangs into her neck. In that moment Diritz quickly stepped across and slew the beast with his power axe, but it was too late for Sympath I. Slug shot pattered off his armour and he called for Prefect Patrinor to stand behind him for protection. Firing between the rebels and the marines soon stopped as the last of the rebel group went down. Kol Lars and Berenito had advanced while they fired and were now standing over the bodies. Irongate coughed and opened his eyes with a jolt. The sky was lighter now as morning cast the first rays of sun across the city. He blinked against the brighter light and winced as he pushed himself up onto his elbows. Grunting, he got up and moved slowly along the side of the wrecked Rhino in a crouch. Flames licked from out the hatches and the large hole he had made earlier. Smoke drifted across in front of him and a smile played across his lips, hidden by the mask he wore. He looked up to see Stub Toes and the Aces High twins at their elevated positions reloading their weapons. As if brought to life, Stub Toes raised his heavy stubber and let rip towards the PDF group. Shots ricocheted against the gantry support struts forcing the men to flatten themselves against it. “Frag this!” yelled Krakin as he loosed a missile towards the same group targeted by Stub Toes. The blast erupted around the men and one was hurled over the barricade like a rag doll. The remaining three staggered out from cover and made a dash for safety to the warehouse door across the road. Flex saw his friend Travis lifted into the air and over the barricade. His hearing was shot, his mind numb from the loss of a friend he knew like family. Nikaulus and Gavier got up and started to run. He could see Nik mouthing something to him and waving his arm for Flex to follow. He started to run too but before he could take more than two steps his legs were cut from under him. He finally saw his friends make it to safety through the warehouse door. Both bikers from the 4th Company arrived along the road. Torrinium had doubled back to Plaza Square when he had heard the Captain on the open channel shouting out his orders to evacuate the Rhino. Bransk had initially headed south, so cut west in a parallel line to Plaza Drive to bring himself around the far end of and then back along the same route the Rhino had travelled. Bransk powered along the road and the wrecked Rhino soon came into view. He saw figures on the gantry ahead and swerved instinctively to avoid any shots. The missile they fired barreled down towards his last position and detonated out of harm’s way. But he was then caught out as a second missile appearing from nowhere hit the ground in front of him which pitched his bike, front wheel first, into the air. Bransk let go of the bike and slid along the road feet first on his back in a shower of sparks from his armour. Torrinium, on the other hand, had turned back and approached more cautiously along the road from the opposite end. Smoke obscured the Rhino and the road ahead. In the warehouse, Shadow and Brothox continued to make their way down the stairs. It was dim inside and as they got closer to the ground floor they could make out the forms of three human figures and a hound lying in pools of blood and gore. Brothox spat, “That’s Mr Gravesend that is”, nodding his head in the general direction of the bodies. “I know” replied Shadow quietly. He quickly held his arm in front of Brothox to stay him. Through the clamour of weapons fire outside footfalls and heavy breathing grew louder and two men in green robes ran into the warehouse just below them. They skidded to a halt in front of the bodies and momentarily looked down at the carnage. In unison Shadow and Brothox raised their rifles and fired. The robed men danced awkwardly as the shells hit them, and finally fell to the ground like puppets cut from their strings. “Brothers, let’s move on” Captain Diritz urged his men over the vox. “ Plaza Square is on the other side of those buildings ahead”. Kol Lars & Berenito were already familiar with the layout of the city streets having studied their roles in this mission meticulously. “Yes sir!” was their reply. Berenito took the lead and Kol Lars stayed to cover the rear of the group. Prefect Patrinor now kept close to Captain Diritz having seen his aids fall quickly to the rebels. Berenito moved along the warehouse wall to the corner and peered around cautiously. “Ambush!” he cried out and swung round the corner of the building and out of view. Immediately Kol Lars and Diritz sprung forward readying their weapons. As they ran closer to the corner they could just see the back of Berenito ahead. He was being assailed by a group of Rabellions who were pitched to a frenzy. Slug shots and blades bounced off his armour as his chainsword drew arcs of crimson in the air. In a matter of moments his assailants had all fallen around him bar one. This last one fell to his knees and held a grenade in his outstretched hands in front of him. It looked almost like he was offering it to Berenito as his hands shook. Berenito’s chainsword made its last arc to decapitate the kneeling Rabellion as the grenade went off. The detonation made Diritz and Kol Lars stagger back and bowled Patrinor over into the dirt. Diritz turned to Patrinor and helped him up. “Are you hurt?” he asked with genuine concern. “No Captain”. Though visibly shaken he kept his voice level. “I desire to stay alive for a few more years. I take it you are up to the task of allowing me to see this through?” He brushed his hands down his clothes in a vain attempt to calm himself. Diritz was taken aback somewhat and fought to stop his choler rise. “That is without question Prefect”. Turning he glanced down at Berenito lying face up where he had fallen having taken the full blast to save his brothers. The armour plate on his chest was cracked and the golden Imperial Aquila was split in two with a line of red blood welling up to the surface. “Leave him, his life sign is too weak to continue with us” Diritz said to Kol Lars. So the three of them left and headed to the Basilica building across the road from them. Bransk leaped back up onto his feet, from the forward momentum of his slide along the road, and started to run. Ahead were two Rabellions behind a barricade below the gantry. Bransk drew his bolt pistol and chainsword as he ran towards them. They exchanged fire. The Rabellion’s shots went wide as he bore down on them. The thunder of his charging footsteps shaking the ground and putting fear into their hearts. His bolt pistol barked twice and the two men crumpled in front of him. He vaulted the barricade and continued his charge along the road. Torrinium’s attention was caught by the sound of the explosion. He could see the figures of his Captain and another marine with the Prefect in the distance entering a building. He steered his bike toward them and started to accelerate. Then as the smoke cleared around the warehouse and gantries the rebels open fired upon him. First, a frag missile from Krakin, streaked in and hit his bike, the blast toppling both over. Torrinium found he was now pinned to the floor by the weight of the bike on his right leg. Knowing he was in a vulnerable position he quickly set to work to prize himself free. With his left leg he started to push the bike. Then a figure came into view above him, breathing heavily from running. The man pointed his gun at Torrinium and the rising whine of the energy build up signaled his doom. The discharge of the Meltagun blew a clean hole through the seat of the bike and the prone marine behind. Hooper heard Irongate call him and turned to see his leader running with Grimm, another Rabellion, towards the Basilica building. Quickly checking the charge of his Meltagun he started off towards Irongate. “We will cut them off at the other side of this Basilica”, shouted Irongate to his men. They ran around to the front of the building and into Plaza Square. At the same time three figures emerged from the front doors. Captain Diritz was leading them. Time seemed to slow down. Bullets whistled between the two groups and missed their targets in what appeared to be in slow streaks with vapour trailing behind. The distance between them shortened with each heart beat and breath. The two marines protecting the Administrator were giants, but that mattered little to Irongate. His loathing of the Imperial cult was like a stimulant in his veins that gave strength to his body and inspired his men. They followed him because he led by example and they feared him, but that was down to what was behind the mask and not the mask itself. 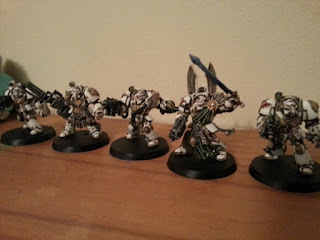 The distinct sound of a bolter round finding its target in the man next to him shattered the fuzzy bubble of the moment and raw noise of the melee erupted around him. Grimm’s feet left the ground as the explosive core of the bolter shell ripped through his chest, leaving a huge exit hole in his back. Hooper saw Grimm crumple to the ground. In the next breath Hooper saw the sun eclipsed by a giant of a man looming over him and the buzz of a chainsword swinging down towards him. Irongate flew at Captain Diritz, his raised powerfist swinging overhead to pound the marine into the ground. Diritz brought his power axe up to block but he couldn’t deflect the full force of the blow. The powerfist grazed down the arm of the Captain forcing a grunt from his throat as pain flared up from his shoulder to his fingertips. Irongate’s charge threw his own balance off and he stumbled into the Captain as his powerfist hit the ground. In the next instant his opponent’s knee came up and connected with the Enforcer’s chest breaking his sternum. Irongate felt a jolt of searing pain in his chest as he was pitched backwards onto the ground. Each breath was painful and like a purifying fire at the same time. Diritz felt his whole left arm go numb as it hung at his side. 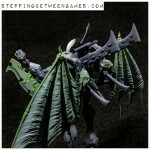 He stepped towards the man in the mask and lifted his axe up ready to finish him. With startling speed, the masked man sprung up and both started to circle each other. Diritz cut a low sweep with his axe which Irongate parried at the last moment with his powerfist. The energy fields of the two weapons repulsing each other in thunderous crackles and blinding white hot light. Both men were finding it hard to penetrate the defense of the other. Diritz was of consummate martial skill and easily out maneuvered Irongate. But, for his lack of skill Irongate was fuelled with hate. This seemed to increase his speed and made the powerfist move through the air with frightening speed. Diritz side stepped another swing from Irongate and immediately reposted with a kick. Irongate managed to grab his opponent’s foot as it struck him and as he fell he brought his powerfist across to strike the exposed leg. Diritz felt the powerfield shatter the bones in his leg but he remained standing. This gave him the opening to strike with his axe. The axe swept down and into the shoulder of the masked man. The power of the stroke followed Irongate’s fall and then pinned him to the ground as it bit into the road. Diritz toppled with him and went sprawling to the floor. As he lay there he felt the stimulants administered by his armour stabilize his organs and central nervous system. He had lost the feeling to both his arm and leg. He was aware of his own voice commanding Kol Lars to take Patrinor to the Palace which was in sight across the square. A while later he saw the masked man lying near him picked up and carried off by the man’s own troops. They didn’t pay him any attention. The must have known he was still dangerous even in his battered condition. “Sir?” The familiar voice of Brother Bransk was close to his ear. He had heard the marine approach across the square while in his recuperative state. “I hear you Bransk. What took you?” he smiled. “The Rebels have gone. I was going to pursue, but knew it best to check on my Captain and brothers first. Kol Lars has confirmed they are now safe inside the Palace. “Good. Now contact Apothacary Jantolus and tell him he has work to do”. Well that's all folks we are currently discussing where the story goes next and will no doubt publish that. 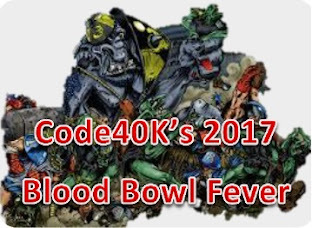 Please leave comments and thoughts on the story and this way of playing 40K? 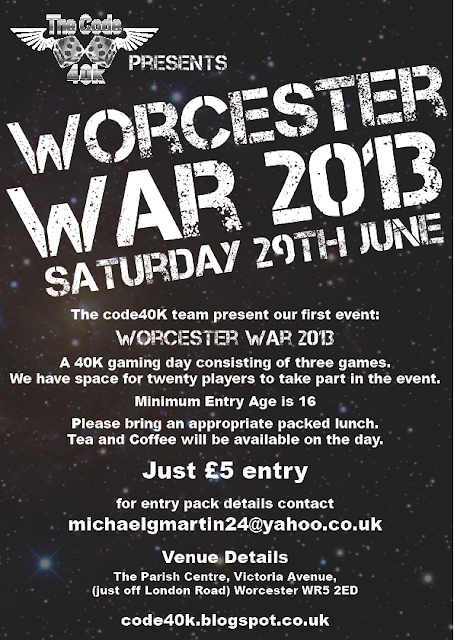 Now on to the work I'm doing to prepare for Worcester War 2013. For me the scenery when you go to an event is important. 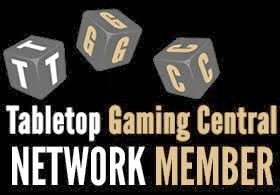 So we need 10 tables worth of scenery. Wooo that's a challenge and luckily the Code boys have a lot of experience and decent terrain amongst them. I'm the proud owner of a realm of battlefield board from GW which I'm currently giving a new lick of paint for the event. In addition even before we decided to have the event I had started some new terrain see here. So I went autumn which is just a bit different and will fit in with the scheme for the whole board. Finally I repairing all the battle damage on this little lot and trying not to annoy my wife too much with taking over this room completely!